We cannot thank you all enough for so generously donating to the Sherpa Family Support Fund. Somehow or other, in just three weeks, we have together raised an incredible £20,000!! Colin and I hoped we would get to £10,000, but it never ever occurred to me we would get double that. I am overwhelmed at your generosity and have been close to tears at times when I saw how much money was coming in and at the thought of how much good we can do with it. My motto has always been “the danger is not in aiming too high, but in aiming too low and achieving it” because I know we are always capable of achieving much more than we think we are and I have not been proved wrong. You are all incredible, thank you! Lunch with the First Minister of Scotland anyone? Salmon fishing on the River Dee? The list of auction items for our Sherpa Family Support Fund is now available. Details can be found at http://www.sherpafamilysupport.co.uk/ . Lots are pretty varied as you can see! Bids can be made by email. It would be wonderful if you could send this on to anyone you know who might be interested. Thank you to my wonderful friends at Braemar Mountain Sports in Scotland for putting this amazing event together and to The Bothy Braemar for hosting the evening. Apologies for sending this again, but the photos and links didn't work in the first one. Three weeks ago (although it seems like much longer) the earth moved below Nepal. It destroyed countless homes, killed thousands of people, and caused a huge avalanche to sweep through Everest Base Camp, killing and injuring many of those in its path. For those who know and love the beautiful country of Nepal and its people, and even for those who don't, the devastation caused by the earthquake has been heartbreaking. We all want to help these people, whose kindness and generosity know no bounds, and who have now lost everything. mountains in the world. I first went out there in 2003 and the following year I was privileged enough to stand on the summit of Everest with Sherpa Ang Nuru, a boy with whom I felt so safe and I know I was lucky to be climbing with him as my partner. I have been to Everest Base Camp almost every year since then, sometimes twice a year, either helping out on expeditions or leading treks. During this time the Sherpas who work with us have become my friends. They welcome me into their houses when I pass through their village and willingly share what little they have with me. Many of them come from the village of Pangboche, which for us mere mortals is 2 or 3 days walk from Base Camp, but they will do the same walk in a day! 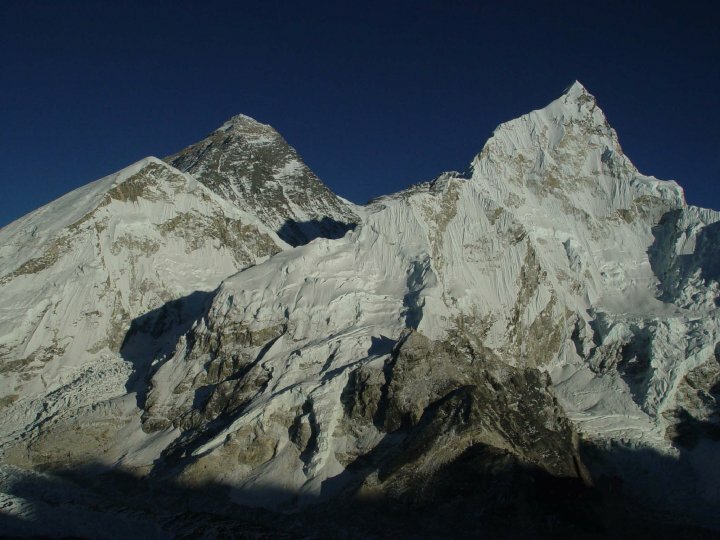 AUTUMN EVEREST BASECAMP TREK - JOIN US FOR THE TRIP OF A LIFETIME! know anyone that might like to join us on this magical and spectacular journey. themselves and it would be wonderful if you would pass the word around. Autumn Everest Base Camp Trek - Join us for the trip of a lifetime! I am writing to you because we are recruiting for another Everest Base Camp Trek this autumn. If you've been with me once don't worry I'm not writing to ask you to come along again! But I just want to let you know about it in case you know anyone that might like to join us on this magical and spectacular journey. This is a fundraising trek, primarily for the charities Women for Women International (www.womenforwomen.org.uk) and International Peace Initiatives (www.ipeacei.org), however you can also join the trek to raise money for a charity of your choice.